They Kane. They Shaw. They Crawford. From the first puck drop to the very last, this NHL season belonged to the Chicago Blackhawks in a way that went beyond even the usual prominence of an elite team. It wasn't so much about dominance (although the team was obviously very good) as it was the fact that they were nearly always the biggest story in the league. It was a start-to-finish run of milestones, comebacks, and dramatic highlights. After being eliminated in the first round of the playoffs last year, the Hawks came out of this season's 34-game-long lockout looking ferocious, starting the season off with a 5-2 whomping of the reigning Stanley Cup champions, the Los Angeles Kings, in the Kings' own arena. 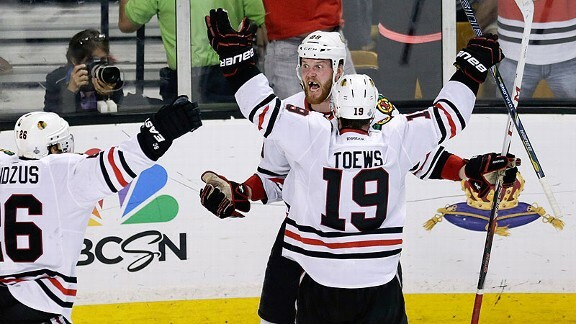 The Hawks then cruised to midseason without losing a game in regulation. That set an NHL record for the longest point streak to start the season — 24 games with either a win or a shootout loss; if you need a refresher on the NHL's points system click here. Meanwhile, backup goalie Ray Emery became the first goaltender in NHL history to start a season with 10 straight wins, which he later extended to 12 consecutive wins, the longest goalie winning streak ever. Not bad for the man notoriously known as "Sugar Ray" due to his reputation as a fighter. The one weakness everyone got wrong. Despite this historic run, hockey experts thought that the Blackhawks' two-goalie system would be a weakness — that switching starts evenly between Corey Crawford and Emery would hurt Chicago because Crawford, the nominal starter, wouldn't get enough reps. Coach Joel Quenneville nonetheless shuffled between the two until Emery went out with an injury, but by that time the system had paid off, and the duo won the first William M. Jennings Trophy — awarded to the goalies whose team allows the fewest goals during the regular season. The near-choke and hair-melting comeback. Having captured the best record in the league, the Blackhawks were favorites to win the Cup. They waxed the eighth-seeded Minnesota Wild in five games and won the first of their series against the rival Detroit Red Wings — but then lost three straight, getting outscored 9-2 in the process. But they came back to force a Game 7, making up a brink-of-elimination 3-1 third-period deficit in Game 6. The slaying of the playoffs' biggest dragons. The Wings' Jimmy Howard had been the hottest goalie of the playoffs until the Blackhawks' comeback, and their next opponent was goalie Jonathan Quick and the Los Angeles Kings. Coming into the series, Quick was also one of the biggest stories of the postseason; he'd been unrelenting between the pipes, allowing just 10 goals in the seven-game series against the San Jose Sharks, but that all ended when he came to Chi-town. The Hawks, powered behind the toothless wonder Bryan Bickell and their heavy hitters, knocked 14 goals past the reigning playoff MVP, clinching the series with a double overtime goal in Game 5 that was a culmination of a hat trick by Patrick Kane, who called it the "best game" of his career. Game 1 of the Stanley Cup Finals set the tone for the entire series: a grueling triple-overtime victory for the Blackhawks, the longest NHL game ever played at the United Center, with over 52 minutes of extra time. The follow-up was equally exhilarating — an overtime win for the Bruins in Game 2. The 17 seconds that will never be forgotten. With the Blackhawks up 3-2 in the series, the Bruins took a 2-1 lead late in the 3rd period of Game 6. But then everything changed in the blink of an eye or, as they say in Boston... I don't know, they probably say the same thing. With just over a minute to go in the game, Bryan Bickell scored the equalizer for the Hawks, and Dave Bolland followed it up with the game-winning goal just 17 seconds later — an NHL record for the shortest span between game-tying and cup-clinching goals in Stanley Cup playoff history. As the clock ran out shortly after Bolland's goal, the Blackhawks became the first team to win both the Presidents' Trophy (for the league's best regular-season record) and the Cup since the 2007-08 Detroit Red Wings — and the first to capture more than one Stanley Cup in the salary-cap era. And so the team that started the season in the record books finished the season in the same style.